Strong banking sector: because the sector was reformed after the financial crisis it was left far more prepared for the recent shock than those in most countries, which then clambered to the same reforms. High liquidity: because the banking system didn't collapse, liquidity in Turkey is high in a liquidity starved world. Rapidly Growing Economy: Since the third quarter of 2009 Turkish GDP has been growing by at least 6% year on year in every quarter. Stable Economy: the Turkish budget deficit is currently among the lowest in Europe. Coupled with strong growth, low public debt, which has been paid down consistently since 2002, this makes the Turkish economy incredibly stable. 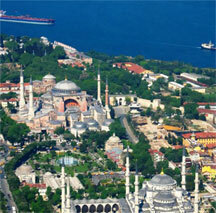 Growing mortgage market: The Turkish mortgage market grew at 20% year on year throughout 2010. Rapidly rising tourism: the tourism market has been growing strongly since 2002, and while it took a slight knock, it continued to grow even during the crisis. Not that these things aren't great of course, but we could do with some new info. Thank fully there is plenty of that just lately. Turkey now fastest growing economy in the world: 11% GDP growth in the first quarter made Turkey the fastest growing economy in the world; convincingly beating Argentina with 9.9% and China with 9.7%. Tourism growth accelerating again: between 2009 and 2010 visitor numbers grew 5.7% according to the tourism ministry. According to the tourism ministry visitor numbers grew 21% year on year in the first 4 months of 2011, and 15% year on year in the first 5 months of 2011. The rising tourism can also be seen in continually positive airport figures. According to the latest release of data on global air traffic, passenger numbers through Turkish airports in June 2011 were up 15% compared to 2010. Record export growth: one of the biggest problems Turkey currently has is its currently account and trade deficits, because imports are far higher than exports. During this year Turkey has broken its record for total monthly exports at least twice, and exports are currently growing at around 20-25% year on year for the last several months. Continued stability: the AK Party has just been re-elected for its third term with a huge majority, which has continued to get larger in each of the three terms. This indicates that the majority of the population is incredibly happy with the government, presenting an incredible level of political stability. Recent data also indicates that Turkey may now be running a budget surplus, continuing the economic stability.